My house has a wonderful bird's nest, I call it as Bird's Lounge. Not build by me but specially made by birds themselves. It is right in front of our front doorway where we have some potted green plants as decor. Any one who comes in, would definitely see this natural lounge. 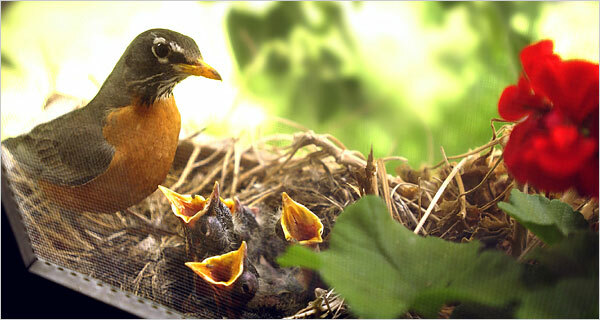 This nest has been here for many many years, really can't remember when these beautiful birds have became my relatives. They come in a pair, make love, lay two eggs, hatch them until they turn chicks, and they would fly away when their young can be independence. About a week or so, new couple would come again to make home in this same nest again. At first I thought they were from the same species, until lately I realised their size and colour are different. So! It looks like my lounge here is meant for multi nationalities without discrimination. The question is; why pick only my house? All my neighbours have attractive home frontage with a bigger garden, whereas my house seems simple and non noticeable. With my many years of observing and even talking with them, I think I know the answer. Birds have instinct. They could sense and see who is kind and friendly. They have better insight than man, when they could almost see our mind and heart. They might be at far over the trees and hills, they could see and understand human's behaviour and character. When I talked to them without a reply from them, I know they could also understand my gesture and language. As long as I'm not a threat to them, I have a chance to befriend them. The smiles and greeting I offer them, touches their heart too. Yes! Today they have accepted me as their kind. And I believe they have also blessed me in many ways. My house is always a warm house for everyone who has no place to stay. And those who live in my house are always healthy and cheerful. Thank you my birdie friends. Please come again. Food for thought - “How do geese know when to fly to the sun? Who tells them the seasons? How do we, humans know when it is time to move on? As with the migrant birds, so surely with us, there is a voice within if only we would listen to it, that tells us certainly when to go forth into the unknown.” - Elisabeth Kubler-Ross Quotes.